Undefeated horses hold a reverent mystique. The rarity of such an accomplishment provides a talking point for lively debate among thoroughbred fans. Triple Crown winners do likewise. Bahram was one of the very few to achieve ultimate status in both categories. As a matter of fact, Bahram was never seriously in danger of losing any of the nine races he competed. Such a lofty career should be revered in turf annuls forever, but I bet many of you do not even know of this exceptional horse. After all, he did his racing eighty years ago. There are not many people around today who can honestly say they saw him run, let alone remember him with vivid detail. Suffice to say we must go by the written words from the days of his racing career, and marvel in retrospect at his superiority. Since the point of this web-site is to honour the greats of the past, omitting a horse such as Bahram would be unkind to his legend. Bahram was bred in 1932 by the Aga Khan III. The Aga sent his broodmare Friar’s Daughter to the court of Blandford. Friar’s Daughter was a modest winner of one race. She carried three crosses of the immortal sire St. Simon (4x4x3) and comes from the immediate family of Plucky Liege. By the time she produced Bahram, Friar’s Daughter had already produced the very good colt Dastur. Dastur won the Irish Derby, Champion Stakes, Coronation Cup and Sussex Stakes. He also finished second in all three English Triple Crown races. Friar’s Daughter also produced stakes winner Fille De Salut by Sansovino. The sire of Friar’s Daughter is Friar Marcus. Winner of the Rous Memorial and the Middle Park Stakes, Friar Marcus became a very good source of speed within the pedigrees of some very good runners. He was the champion broodmare sire in 1935, thanks largely to the exceptional year authored by Bahram. Friar Marcus descends in tail male from the important stallion Bona Vista, through the equally important Cyllene, to Cicero. Blandford, the sire of Bahram, brings in another very important tail male sire line. A son of the influential classic winner Swynford, Blandford continued the line with remarkable efficiency. From limited opportunities, Blandford carved out a prolific stud career. He sired four Epsom Derby winners and many of his sons became world class sires in their own right. The names of Blenheim, Umidwar, Brantome and of course Bahram prove his legacy as an important sire. 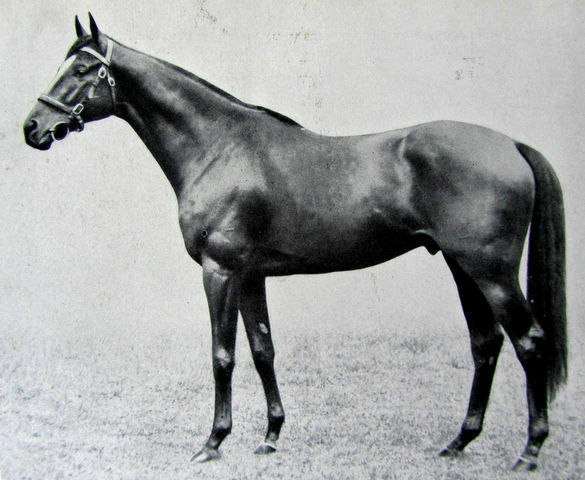 Blandford was a three times leading sire in England/Ireland. Blandford was a fragile horse. He overcame an attack of pneumonia as a yearling and was accident prone when in training. Blandford was not what one would call an attractive colt either. He had short forearms, a hollow back and unharmonious lines. Due to his weak constitution, Blandford made only four starts in racing. He did win three of his four races, taking the Prince of Wales Stakes as a three year old. Blandford however became an influential sire when sent to stud, as he was able to pass on some excellent qualities from his own ancestors and not so much of his own deficiencies. In opposition to his sire, Bahram had exquisite conformation. He stood 16.2 hands when full grown, and possessed a very sociable easy going temperament. Frank Butters was entrusted as his trainer and he described Bahram as a gentle giant. His action was so smooth and effortless, jockey Freddie Fox likened riding him to riding on a cloud. His placid nature however transmitted an air of lethargy when training. The first race for Bahram came in the National Breeder’s Produce Stakes at Sandown. Likely due to his somewhat indifferent trials, Bahram went to the post as a 20-1 outsider. He powered through the stretch to overtake stable mate Theft by a half length at the finish line. Bahram then won the Rous Memorial a couple of weeks later at Goodwood, but the word was out and he ran as the betting favourite. His lackadaisical tendencies re-emerged in his next start, the Gimcrack Stakes at York. Fox had to really shake him up hard to run past the field and take the two length win. Butters gave Bahram some let down time to prepare the colt for a pair of autumn stakes events. Bahram was in the start for the Boscawen Stakes at Newmarket, which he won with ease. The Middle Park Stakes was next on the agenda. Back in 1934, this race was considered as one of the most important on the juvenile colt calendar. Bahram didn’t loaf on this occasion as he completely dominated the Newmarket race to win in record time. With a five for five two year old season, Bahram was named as the highest rated colt for the year. His 133 pounds Free Handicap assessment was testament to the admiration he had earned. Bahram continued to grow and fill out during the 1934-35 winter and had become an even more impressive equine specimen. He still had his placid personality and he was not much of a worker on the training gallops. Bahram was due to begin his three year old campaign in the April Craven meeting at Newmarket, but Frank Butters was not convinced the colt was ready. Butters had to revert to plan “B” and unleashed his undefeated colt in the 2000 Guineas. Going off at 7-2 odds, Bahram was barely on the bit as he cruised to win the classic on the famed Rowley Mile course. Stable mate Theft was two lengths back in second place. The Epsom Derby was due in a month, and the press and public were anticipating Bahram to continue his dominant ways. Heavy rain blanketed the Epsom area on the morning of Derby day in 1935. Despite the challenging weather, a huge throng of racing fans flocked to the downs. Estimated at over 300,000, the fans were treated by Mother Nature and the skies cleared to bring glorious English sunshine to the famous race course. The course was still a bit soft, but in excellent condition. King George V was in attendance, marking his twenty-fifth year as ruling monarch. All had come to see if Bahram could carry his smooth speed to the classic twelve furlongs distance. The Epsom crowd had complete faith in Bahram and bet him down to 5-4 before the start. Bahram broke slowly, but Fox had him moving with little effort. As the field approached Tattenham Corner, Bahram had glided up to third position. After Tattenham Corner the race was all but over. Bahram accelerated to the lead and went into cruise control for the final furlong. He won by a comfortable two and one half lengths. Taking his second classic victory, the big bay colt stamped his authority on the field. Bahram came back from his Epsom outing in perfect condition, so Butters entered him in the St. James Palace Stakes at Royal Ascot later in June. Bet down to odds on at 1-8, Bahram again cruised to the front to win. “He barely broke sweat”, was the after race comment from jockey Freddie Fox. Butters was in complete admiration for his unbeaten colt. As with most supreme champions, a little adversity would intervene in a storybook career. During the summer of 1935, a coughing epidemic gripped many of the training stables in England. The Aga Khan’s stable was not immune to the outbreak. Bahram caught the epidemic and missed some very valuable training due to the infliction. He did recover in time to make history though. September at Doncaster Race Course means one thing, the tradition of the third jewel in the English Triple Crown. The St. Leger Stakes, run as always at the fourteen furlongs and one hundred and thirty-two yards distance, highlights the meet. Most of the racing faithful came to Doncaster to see if Bahram could become the first Triple Crown winner since Gainsborough. Gainsborough in 1918, Gay Crusader in 1917 and Pommern in 1915 had all won war time Triple Crowns. Many purists refuse to list the three as legitimate winners of the elusive feat because some of the races were run at race courses other than the traditional Newmarket, Epsom and Doncaster venues. World War 1 took care of the relocation to some of the classics due to the fear of attack. Rock Sand in 1903 was the last winner before Bahram’s year to win the Triple Crown at the traditional locations. Whether you say he was attempting to become the first since 1918, or the first since 1903, Bahram was poised to accomplish a very rare achievement. He came into the race off his interrupted training schedule, which some thought might be his undoing. To make matters a little more difficult, Freddie Fox suffered a serious injury the day before the St. Leger and had to withdraw as Bahram’s rider. Charlie Smirke, one of the best jockeys in history, was selected to take the reins. Most of the attendees at Doncaster were in agreement in deciding that Bahram would complete the Triple Crown attempt. Betting him down to 4-11 odds on before the race, the public proved their faith. Bahram did not disappoint. He captured the St. Leger by a commanding five lengths in front of Solar Ray. Smirke later told reporters; “Bahram could have won with twelve stone and two jockeys on his back”. Bahram was retired from racing and entered stud at Edgerton Stud in Newmarket. He became the first Triple Crown winner since Ormonde in 1886 to retire undefeated. The Aga Khan was so entrance with his champion that he proclaimed him as the “Horse of the Century”. One of London’s big newspapers, the Daily Mail agreed with the Aga Khan. However The Times rated Windsor Lad, another son of Blandford who won the Derby and the St. Leger the year before Bahram to be better horse. Frank Butters said post career that because of his champion’s laziness, he never really knew how good Bahram could have been. Once retired from racing, Bahram became even more placid and lazy. He acted is if he did not have a care in the world. No one ever saw him aroused to the point of being in a bad mood. It just didn’t happen. Bahram spent the first five years of his stud career in England. He sired some very good ones such as King George VI’s Big Game. Out of the Tetratema mare Myrobella, Big Game won eight of nine races including the 2000 Guineas and was a powerful colt with an abundance of speed. His only loss came in the war substituted 1942 Derby on the July course at Newmarket, fishing sixth to Watling Street. He later became a leading two year old sire in England/Ireland. He also led the broodmare sire list twice. Other notable offspring sired by Bahram in England includes Turkhan (Irish Derby, St. Leger Stakes), Queen of Shiraz (Irish Oaks) and Persian Gulf (Coronation Cup). Persian Gulf is the link to one of the best sires in recent breeding today. He is the sire of Tamerlane (St. James Palace Stakes, July Stakes), who in turn sired Dschingis Khan. The latter was bred in Germany and started an influential sire line there, especially through his German Triple Crown winning son Konigsstuhl. Konigsstuhl sired the world elite sire Monsun, keeping the Bahram male line in the forefront of world class breeding. Late in 1940 the Aga Khan III sold Bahram to an American syndicate headed by Alfred Vanderbilt. Bahram stood at Vanderbilt’s Sagamore Stud in Maryland and at Walter Chrysler’s North Wales Stud in Virginia during his time in the U.S. Bahram did not do well at stud in America, as he did not seem to mix productively with the mare population on offer to him. He did get a couple of descent runners in Stud Poker and Stone Age. His claim to breeding fame in North America is as the dam sire of Canadian Hall of Fame legend He’s A Smoothie. The syndicate sold Bahram to Argentinean interests in 1945. Bahram stood in Argentina until he passed away at the age of twenty-four in 1956. He did not have success in South America either. Aside from his misplaced stud career after leaving England, Bahram was a super horse. When he was sold to the U.S. syndicate, British and Irish breeders were furious with the Aga Khan for selling the champion away. They were all ready annoyed when the Aga sold both Blenheim and that one’s son Mahmoud to America, but now another of the Blandford line stallions was leaving. Both Blenheim and Mahmoud were huge successes in American breeding, but Bahram failed. It is a curious twist of fate that the best runner of the three did not mesh well with the mare population in America. Bahram seemed to be doing well enough in England and Ireland however. Blenheim and Mahmoud had their stud careers take off after they relocated to the colonies. Breeding can be so unpredictable. Take nothing away from Bahram as a runner of superior quality and class. An undefeated Triple Crown champion is the rarest of all thoroughbreds in any racing jurisdiction, in any era. Bahram was never fully tested in a race. He was a lovely animal in both ability and temperament. He was beautiful to look at with a flawless conformation and a gleaming bay coat with a white star on his forehead. Bahram had it all, looks, ability, manners and class, oodles of class. It would have been a special treat to have watched this incredible equine athlete perform. I am sure that anyone who did see him never forgot him. Future generations of race fans should not forget him either. Did not know he was that good. He looks like a champ. Never beaten huh! Too bad he didn’t catch on in the states at stud. If he had he would be much more well known. Hell of a horse though. Never heard of him before reading this good article. Unbeaten and a triple crown winner and Monsun is a descendant. Talk about an important horse. Wow. Thank you for writing about Bahram and introducing to me a great horse that I wish I could have seen run. Such info is a lesson for me. I hope you find more unknown greats and write articles about them. Thanks. Just found this web site. You bring these wonderful horses to life and I feel as if I get to know them. Never heard of Bahram but it obvious he was very special and Monsun is a direct descendant which makes me happy because he is a favourite. I am going to read the Monsun story but I want to thank you for this story. It was wonderful. Have read bits about Bahram before and seen photos but not read su h a comprehensive history so very interesting thankyou. I could hardly believe my eyes when I saw your article on Bahram! He was my first Thoroughbred’s great great grand sire so I find your account of him extremely interesting. Thank you for this wonderful insight.